Son of a noble family, how should any son or daughter of noble family train, when they wish to practise the profound transcendent wisdom? The Karmapa skilfully explained how what appears to be one question actually encompasses all aspects of the practice of the Mahayana from the beginning of the path to the attainment of buddhahood. Shariputra appears to ask how someone who wants to practise diligently should train, but there are in fact five questions embedded in this one question. What mind-set is needed in order to cultivate or familiarise ourselves with prajna pāramitā (the perfection of wisdom)? What kind of conduct or actions should we carry out in order to cultivate or familiarize ourselves with prajna pāramitā? What kind of direct realisation should we attain in order to cultivate or familiarize ourselves with prajna pāramitā? Which method of practice should we use? What realisations are necessary in order to cultivate and familiarize ourselves with prajna pāramitā? These five questions correspond to the five paths, so Shariputra is actually asking how a bodhisattva should practise on the path of accumulation, the path of joining, the path of seeing, the path of cultivation, and the path of no more learning. The Vajradhara Lineage Prayer expresses the wish: “Throughout all my lives, may I not be separate form the perfect lama. Perfecting the qualities of the paths and levels, may I quickly attain the state of Vajradhara.” The paths are the five paths and the stages are the ten bhumis (levels) of the bodhisattvas who have directly realised emptiness. His Holiness clarified that the difference between the five paths and the ten levels is one of scope. The former is broader and includes ordinary bodhisattvas, whereas the ten bhumis, because they are based on the realization of emptiness, are limited to those who have realized emptiness. The five paths are graduated and followed sequentially from the very beginning until the attainment of buddhahood. In addition, within each path there are stages: the path of accumulation has three stages (lesser, middling, and greater), the path of joining has four stages ((heat, peak, forbearance, highest dharma), the path of seeing has sixteen stages (or moments), and the path of cultivation consists of the ten bhumis. Avalokiteshvara’s answer is the sixth section of the sutra. When Avalokiteshvara answers Shariputra’s question, there are in fact eleven different replies in accordance to the different abilities of his audience. Though the audience listening to the Heart Sutra had higher mental faculties, His Holiness commented, there were still different capabilities, so the answer was given in two sections. The first part was intended for those with lesser capabilities, and the second part was for those with higher capabilities. The second part included the secret mantra itself, which contains all the key points for those of the highest level, who would be able to understand everything directly through a few words. …Any son or daughter of noble family who wants to practise profound transcendent wisdom should view it in this way. Simply put, His Holiness commented, this refers to all who have the right to listen to the prajna pāramitā teachings and who want to practise. To “view it in this way” means to use four types of meditation to closely examine all phenomena. 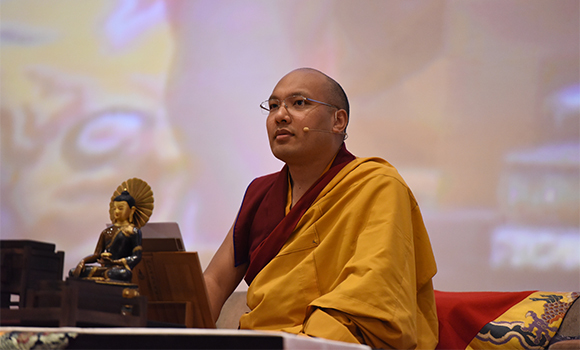 The Karmapa reiterated the importance of shamatha (calm abiding) meditation on the path, and detailed the four stages of shamatha meditation, as defined in the Sutra of the Explanation of the Profound Secrets. These should be practised in sequence. In the third stage, through meditative concentration and powerful analysis, the practitioner is able to directly experience emptiness. At this point the practitioner’s meditative concentration is the union of shamatha and vipashyana (insight), and is called the path of seeing because the practitioner has seen emptiness directly for the first time, and consequently becomes a noble being. Subsequently the wisdom gained from seeing emptiness is maintained on the path of cultivation. This stage of meditation is known as the object of the extreme of things, because on the path of seeing and on the path of cultivation the meditator is able to see the true nature of all things, the emptiness (extreme) of all phenomena (objects). With ceaseless practice, the meditator ultimately attains buddhahood and their meditative concentration achieves the ultimate perfection. Because all that has to be done has now been accomplished, this final stage of meditation is known as the object of the accomplishment of all things. His Holiness then summarised the five paths to buddhahood. From the very beginning, hearing and contemplation is vitally important because we need to stabilise our understanding and knowledge of the Mahayana teachings. This is the path of accumulation. We then need to gradually cultivate our concentration in order to further analyse and examine what we have heard and contemplated. Then, through actual practice, we develop a deep understanding and experience. This is the path of joining, preliminary to the path of seeing. Once the practitioner has a direct realization of emptiness that is stable, they have arrived at the path of seeing, and then they move along the stages of the path of cultivation, until they finally arrive at the path of no more learning. In the second part of the first reply, the text states: “Form is emptiness; emptiness is form.” Form comes first because it is the container for the other four aggregates. Recognizing the emptiness of form eliminates the container of form, and then everything inside will be dispersed, the Karmapa explained. The text continues with the emptiness of sensation, perception, and formation. The reference to the emptiness of sensation targets lay people, for whom enjoyment rules like a king. The emptiness of perception is aimed at the ordained, for whom there are different schools of thought, and based on these, they claims for the superiority of their particular school. Sensation and perception are two of the 51 mental factors. They have been selected because they are at the root of the problem. The other 49 factors belong to formation, and the fifth skandha is consciousness. The second part of the first response reads: ”Form is emptiness; emptiness is form.” These two assertions are safeguards against falling into either of the two extremes of samsara or nirvana. Since sentient beings desire the enjoyments of form, they have fallen into samsara. To prevent them from falling into samsara, they have to be freed from their attachment to the enjoyments of form. However, someone who desires emptiness instead of form would fall into the other extreme of nirvana. An analogy is a blind person walking along a narrow path with a forbidden place on one side and a precipice on the other. If someone were to shout a warning, “Watch out to the left!” they would veer to the right and fall over the edge on the left side, and the same would be true for the other side. The only safe path is to keep to the middle. The lines “Form is emptiness; emptiness is form. Emptiness is none other than form; form is none other than emptiness” explain the object of meditation for those on the path of joining. To say “form is empty” does not mean that form does not exist, but rather that form and all phenomena do not exist in the way that we experience them. To explain this situation, His Holiness used the analogy of the moon reflected in water: The water can clearly reflect the moon, but the actually water never had a moon within it. The image of the moon can appear clearly on the surface of the water, but it is not really there. Likewise, in dreams we see objects clearly but they, too, are not truly existent. Many people misunderstand “empty” to mean non-existent, but this is not the case. The word empty in this context has a special, unique meaning, which makes it difficult to comprehend. His Holiness concluded by saying that he would continue the discussion of emptiness in the afternoon.